QUESTION: what is the point of goldenrod? Is there really any objective, verifiable difference between a weed and a plant? Is it really just in the eye of the beholder? Assuming this is a native plant, how does it help the greater ecosystem if it’s just taking up a little spot in my front yard? If I decide to keep the goldenrod, assuming that’s what it is, how would a native plant activist feel about me moving it out of the way? Does that disturb the whole notion that we should just leave native plants well enough alone, wherever they happen to reside? Would moving it be better than pulling it out and feeding it to my compost bin? Would doing so, in the eyes of the nativist, be a sin? Help me out here. I don’t mean to disturb the universe. So, go ahead … gimme the dirt! I recently listened to a podcast where someone said ‘a weed is an herb growing in the wrong place’. It still makes sense if you broaden the term herb to plant. Although I never thought of it, weeds serve to help the garden. Weeds are often some of the first flowers to appear in the garden and attract bees and other beneficial insects. 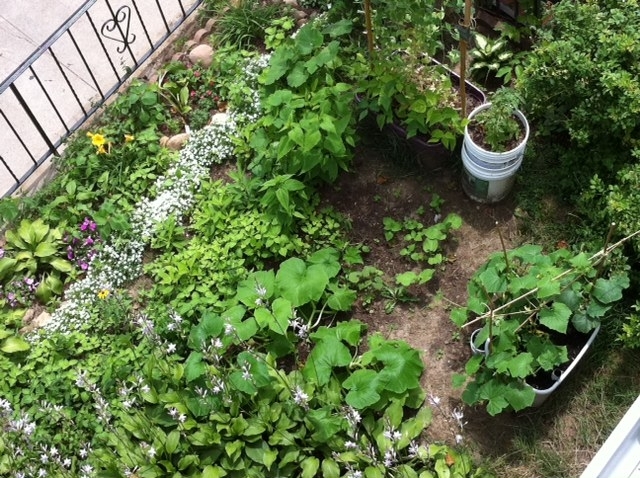 Check out http://www.theselfsufficientgardener.com and listen to the episode on weeds. It gave me a whole new outlook on weeds, and gave my garden a different look- especially the part that now grows wild. Once I did go walking through the wild section with a machete. It’s not that it is that wild, I just needed to cut the tall grass seeds and get rid of them without damaging the red clover growing below. The lawn mower would have cut everything. I haven’t had to use the lawn mower once this year- good for the environment. Before winter I will need it to cut everything down which will then become mulch. I have relocated plants out of the way on occasion. I think it’s OK, it gives both plants a better healthier life. You’re not moving them, you’re giving them a better location. I hate to kill plants, especially if I planted them. So far at least, it seems like doing things more naturally is easier and costs less. To use another podcast’s tag line, ‘who knew dirt could be so much fun’. Sorry if this is in the wrong place, I don’t know if posting replies to very old posts are flagged somehow. I just listened to a program that had an alternative to Triscuit (sp) cards. Fold a paper towel, moisten it. Spread seeds on the moist towel and cover with another folded moist paper towel. Keep moist and you can watch as the seeds sprout. Once they are off to a good start, take the seeds in the paper towels and cover with soil in the yard. The towel will decompose and the seeds will grow. This was used to test 2 year old seeds to see if they would still grow. They did.